The price of petrol and diesel in the UK has risen to its highest since July 2015, following a three-pence-a-litre increase in December alone. 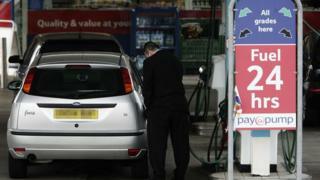 The average cost of unleaded petrol hit 117.23p at the end of the month, with diesel reaching 119.63p, the RAC said. The wholesale price of both fuels has risen significantly, following the production cuts announced by Opec. Brent crude jumped by 10% on 30 November, the day the cartel announced a cut of 1.2 million barrels a day. As a result, the oil price is now double what it was a year ago, rising from a low of $27.88 in January 2016 to more than $55 this month. The fall in the value of sterling since the Brexit vote has also increased UK fuel prices, as oil is priced in dollars. Over the next two weeks, the RAC expects the price of unleaded to rise to 118p, with diesel going up to 121p a litre. Thereafter, the price will be mostly determined by the cost of oil and whether Russia in particular will adhere to the production cuts it agreed with Opec. It promised to cut 600,000 barrels a day from January, but in the past it has been reluctant to co-operate with such deals. Image caption Will Russia turn off the taps as it has promised? "So far the price rises we've seen are purely down to the announcement at the end of November that Opec and non-Opec countries would be cutting oil production this month," said Simon Williams, a fuel spokesperson for the RAC. "Everything now depends on the strength of the deal and each country sticking to the agreed production levels. Russia will be of particular interest as it is currently producing at near record levels." Over the next few months, the price of fuel will also be determined by political events, such as policies introduced by President Donald Trump, and the success of Brexit negotiations, which are due to begin in March. Both could affect the value of sterling against the dollar. Some experts believe the price of oil could also rise to $60 a barrel or more later this year.